Below are four more ways to protect your lower back from pain and injuries while on a road trip this summer. Remember, if you require chiropractic care before or after your trip, or become injured in an auto collision during your trip and need an auto injury treatment, our chiropractor and massage therapist can help. Driving long distances can cause muscle cramping, spasms, and pain in your lower back. It is important to make pit-stops so you can get out of the car, stretch your back and legs, and walk around to get the blood flowing. Take a short walk around a rest stop or hike a scenic trail to capture stunning photos of a scenic area on your trip. This will get your heart rate going to support blood flow and healthy circulation, which can reduce cramping and discomfort while you drive. It’s important to get adequate sleep during your trip to support your health and wellness. Many people are surprised to learn of the importance of sleep for relieving back pain. In order to heal from pain and injuries, your body needs time to recover, heal, and recharge. Make sure you get seven-to-eight hours of sleep each night during your trip. Vacations usually consist of eating lots of junk food in the car and indulging in extravagant, high-calorie, high-fat meals at restaurants. We’re not saying to completely avoid treating yourself to delicious foods during your trip, but it’s good to be mindful of what you eat. Work a few healthy meals and snacks in to ensure you get the nutrients and vitamins your body, spine, and tissues need to function properly. Remember, fattening, greasy foods aggravate inflammation, which can enhance your lower back pain and discomfort. Whether you need an adjustment to realign your spine after your trip, or you were involved in an auto accident and require auto injury treatment to heal and recover, our team at Arne Wellness Center can help. Give us a call to arrange a pre- and post-trip chiropractic adjustment to reduce lower back pain. 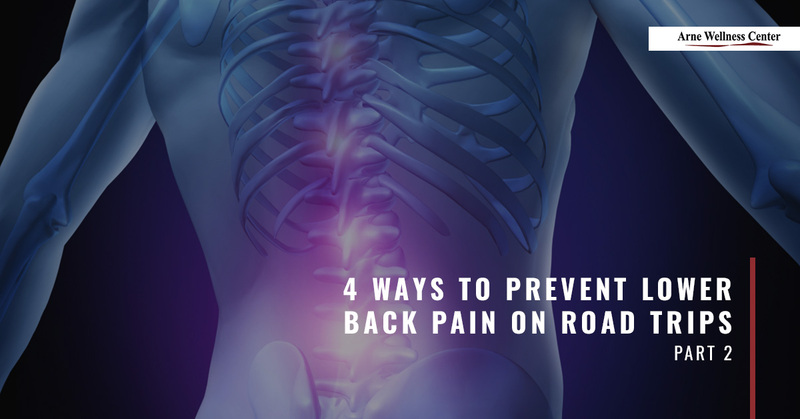 Join us for part three of this blog series to learn even more ways to prevent lower back pain during a road trip. Until then, thanks for reading.